Enoch A. Oie was born on 16 October 1907 at South Dakota. He was the son of John Eric Oie and Gunhild Stoen. Enoch A. Oie obtained US Social Security Card at South Dakota; last residence Phoenix, Maricopa, Arizona. [S184] Beresford Republic Newspaper, Vol. 100, 1993 July 15. Name Variation Kermit Arden Oie was also known as Kermit J.
Kermit Arden Oie was born on 2 February 1909 at South Dakota. Kermit Arden Oie died on 3 April 1955 at Union, South Dakota, at age 46. He was buried after 3 April 1955 at Roseni Lutheran Church Cemetery, Beresford, Union, South Dakota. Name Variation Hazel I. Oie was also known as Hazel J.
Hazel I. Oie was born on 19 August 1916 at South Dakota. She was the daughter of John Eric Oie and Gunhild Stoen. Helen G. Oie was born on 19 August 1916 at South Dakota. [S184] Beresford Republic Newspaper, Vol. 101, 1994 Sep 8. Name Variation Johan Johansen Buum was also known as John Sr.
Name Variation Johan Johansen Buum was also known as John J.
Johan Johansen Buum was born on 29 July 1872 at Norway. He was the son of John R. Buum Jr. and Gertrude Quall. Johan Johansen Buum married Betsy Jamtgaard, daughter of Johan Olsen Jamtgaard and Olava Quall, on 8 April 1898. Johan Johansen Buum died on 4 October 1934 at Union, South Dakota, at age 62. 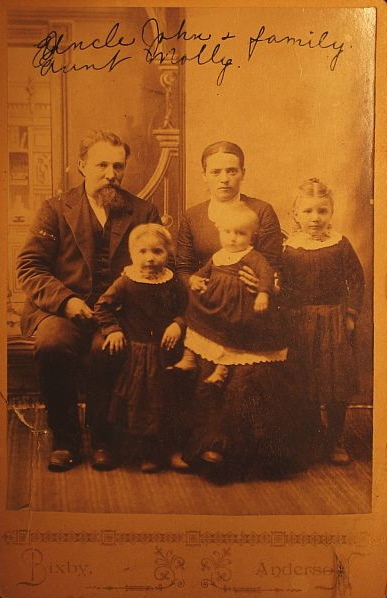 Johan Johansen Buum immigrated with John R. Buum Jr. and Gertrude Quall in 1889. [S245] U.S. Federal Census 1900 U.S. Federal Census, by Ancestry.com, ED340. Dwelling 140. [S244] U.S. Federal Census 1910 U.S. Federal Census, by Ancestry.com, ED431. Dwelling 121. [S243] U.S. Federal Census 1920 U.S. Federal Census, by Ancestry.com, ED250. Dwelling 5. [S250] U.S. Federal Census 1930 U.S. Federal Census, by Ancestry.com, ED64-10. Dwelling 41. Name Variation Gelina Buum was also known as Galine. Married Name 26 December 1924 As of 26 December 1924,her married name was Evjen. Gelina Buum was born circa 1903 at South Dakota. She was the daughter of Johan Johansen Buum and Betsy Jamtgaard. Gelina Buum married Alfred Evjen, son of Carl Olson Evjen and Helmine J. Christopherson, on 26 December 1924 at Union, South Dakota. Gelina Buum died before April 1978. [S250] U.S. Federal Census 1930 U.S. Federal Census, by Ancestry.com, Year: 1930; Census Place: Emmet, Union, South Dakota; Roll 2232; Page: 1A; Enumeration District: 10; Image: 148.0. Joe Marx Buum married Wilhemina Magdelina Hemmelrick. He was the son of Johan Johansen Buum and Betsy Jamtgaard. Joe Marx Buum died in 1982. [S9] South Dakota, South Dakota Birth Records South Dakota, State File Number: 788705 (unknown file date). Julius O. Buum died in February 1982 at age 76. Julius O. Buum obtained US Social Security Card at South Dakota; last residence Alcester, Union, South Dakota. [S9] South Dakota, South Dakota Birth Records South Dakota, State File Number: 5843 (unknown file date). Oscar Melvin Buum was born on 21 February 1913 at South Dakota. Oscar Melvin Buum died on 22 December 1975 at Hennepin, Minnesota, at age 62. Name Variation John R. Buum Jr. was also known as Joe B.
John R. Buum Jr. was born on 26 May 1846 at Norway also reported as May 1849. He married Gertrude Quall, daughter of Lars Olsen Quall and Anne (? ), circa 1870. John R. Buum Jr. died on 14 May 1920 at Union, South Dakota, at age 73. John R. Buum Jr. and Gertrude Quall immigrated in 1889. [S245] U.S. Federal Census 1900 U.S. Federal Census, by Ancestry.com, ED340. Dwelling 139. [S244] U.S. Federal Census 1910 U.S. Federal Census, by Ancestry.com, ED431. Dwelling 122. Name Variation Gertrude Quall was also known as Qvaale. Name Variation Gertrude Quall was also known as Kvalle. Married Name circa 1870 As of circa 1870,her married name was Buum. Gertrude Quall was born on 20 March 1849 at Orkedalen, Norway. Gertrude Quall married John R. Buum Jr. circa 1870. Gertrude Quall died on 6 July 1914 at Union, South Dakota, at age 65. She was buried after 6 July 1914 at Roseni Lutheran Church Cemetery, Beresford, Union, South Dakota. Original Name Was Kvaalesmo,Shortened To Kvaale And Finally To Quall. Gertrude Quall and John R. Buum Jr. immigrated in 1889. Gertrude Quall had 10 with 8 living in 1900 children. She had 10 with 7 living in 1910 children. Children of Gertrude Quall and John R. Buum Jr.
Name Variation Bernt J. Buum was also known as Ben. Bernt J. Buum was born on 22 October 1878 at Norway also reported as Oct. 22, 1877. Bernt J. Buum married Inga Hansen on 29 May 1908. Bernt J. Buum died on 30 June 1962 at Union, South Dakota, at age 83. He was buried after 30 June 1962 at Roseni Lutheran Church Cemetery, Beresford, Union, South Dakota. Bernt J. Buum immigrated with John R. Buum Jr. and Gertrude Quall in 1889. [S250] U.S. Federal Census 1930 U.S. Federal Census, by Ancestry.com, ED64-10. Dwelling 51. Name Variation Inga Hansen was also known as Hanson. Married Name 29 May 1908 As of 29 May 1908,her married name was Buum. Inga Hansen was born on 8 September 1885 at Norway. She married Bernt J. Buum, son of John R. Buum Jr. and Gertrude Quall, on 29 May 1908. [S184] Beresford Republic Newspaper, Vol. 78, 1971, Dec 2. Name Variation Gottlieb J. Buum was also known as G. J.
Gottlieb J. Buum was born on 26 October 1909 at South Dakota. He was the son of Bernt J. Buum and Inga Hansen. Gottlieb J. Buum married Myrtle Ronning, daughter of Ole A. Ronning and Ellen Solberg, on 28 December 1935 at Union, South Dakota. Gottlieb J. Buum died in July 1979 at age 69. Gottlieb J. Buum obtained US Social Security Card at South Dakota; last residence Alcester, Union, South Dakota. John Hebeler married Mary Luy. John Hebeler was born circa 1839 at Germany. He died on 14 December 1895 at Clinton, Comanche, Iowa. Elizabeth Hebeler was the daughter of John Hebeler and Mary Luy. Frank Antone Kantowski was born in October 1860 at Germany. He married Selma Amalia Pfotenhauer circa 1893. Frank Antone Kantowski died after May 1930. Frank Antone Kantowski immigrated in 1882 also reported as 1880. [S245] U.S. Federal Census 1900 U.S. Federal Census, by Ancestry.com, ED181. Dwelling 443. [S243] U.S. Federal Census 1920 U.S. Federal Census, by Ancestry.com, ED188. Dwelling 97. [S250] U.S. Federal Census 1930 U.S. Federal Census, by Ancestry.com, ED33-14. Dwelling 176. [S9] South Dakota, South Dakota Birth Records South Dakota, State File Number: 567794 (unknown file date). Married Name circa 1893 As of circa 1893,her married name was Kantowski. Selma Amalia Pfotenhauer was born in May 1872 at California. She married Frank Antone Kantowski circa 1893. 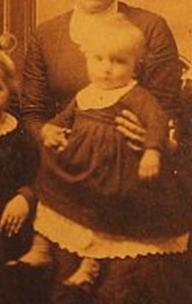 Selma Amalia Pfotenhauer died after May 1930. He was the son of Frank Antone Kantowski and Selma Amalia Pfotenhauer. Albert F. Kantowski died on 15 January 1928 at Hughes, South Dakota, at age 31. [S9] South Dakota, South Dakota Birth Records South Dakota, State File Number: 386821 (unknown file date). Married Name 17 August 1921 As of 17 August 1921,her married name was Ballou. Clara Cecelia Kantowski married Louvern Joseph Ballou on 17 August 1921 at Hughes, South Dakota. Clara Cecelia Kantowski died in January 1984 at age 83. Clara Cecelia Kantowski obtained US Social Security Card at South Dakota; last residence Tempe, Maricopa, Arizona. (?) Birch married Mary Delila Kent, daughter of John Waters Kent and Celestia Ann Tremain, circa 1882 at first marriage for Mary. John Warren Metcalf was born on 10 February 1859 at Sac City, Sac, Iowa. He married Sarah Elizabeth Warren on 18 August 1880 at Roxbury, Kansas. John Warren Metcalf married Mary Delila Kent, daughter of John Waters Kent and Celestia Ann Tremain, circa 1890 at second marriage for Mary, McPherson, Kansas. John Warren Metcalf died on 15 December 1935 at Battle Ground, Clark, Washington, at age 76. [S243] U.S. Federal Census 1920 U.S. Federal Census, by Ancestry.com, ED32. Dwelling 185. [S250] U.S. Federal Census 1930 U.S. Federal Census, by Ancestry.com, ED6-49. Dwelling 287. Married Name circa 1918 As of circa 1918,her married name was Condon. Emma Elizabeth Metcalf was born circa 1899 at Washington. She was the daughter of John Warren Metcalf and Mary Delila Kent. Emma Elizabeth Metcalf married Frank Wilber Condon circa 1918. [S243] U.S. Federal Census 1920 U.S. Federal Census, by Ancestry.com, ED32. Dwelling 186. Frank Wilber Condon was born circa 1893 at Kansas. He married Emma Elizabeth Metcalf, daughter of John Warren Metcalf and Mary Delila Kent, circa 1918. [S323] Washington Death Index, 1940-1996 (published), certificate 002363. Married Name 18 August 1880 As of 18 August 1880,her married name was Metcalf. Sarah Elizabeth Warren was born circa 1865 at Kentucky. She married John Warren Metcalf on 18 August 1880 at Roxbury, Kansas. Clifford H. Metcalf was born on 29 November 1894. Clifford H. Metcalf died on 11 September 1900 at age 5. Laura Metcalf was born circa 1892. Married Name Her married name was Fitz. Alice Metcalf was born circa 1891. George Metcalf was born circa 1888. He was the son of John Warren Metcalf and Sarah Elizabeth Warren. George Metcalf died on 18 January 1892. Elizabeth J. Montgomery was born on 1 December 1863 at Franklin, Virginia.